Post operative nausea and vomiting. Sickness due to inner ear problems such as Meniere's desease. Please note: Other generic brands may be supplied in place of TEVA. Adults and children over 12 years of age: ONE tablet (50mg) up to three times daily. Children from 6 to 12 years of age: HALF a tablet (25mg) up to three times daily. Children under 6 years of age: Not recommended. Do not give to children under 6 years. These tablets may make you feel dizzy or drowsy. If affected do not drive or operate machinery. Do not take these tablets if breast feeding. Avoid taking alcohol. Multiple orders made within a short space of time will be rejected.If you find that you need to use Cyclizine for a prolonged period of time speak to your doctor or call and speak to our pharmacist for advice. Alternative travel sickness product: Stugeron 15mg x 100 Tablets. We are unable to supply Cyclizine to pregnant women. This should be prescribed by your G.P. to ensure safety of both mother and baby. If any of the below relates to you it may be necessary for you to only take Cyclizine under medical supervision. Please see your G.P. as there could be an underlying cause of your nausea/sickness. If you do not know the cause of your nausea or are having recurrent episodes it is important that you should consult your G.P. 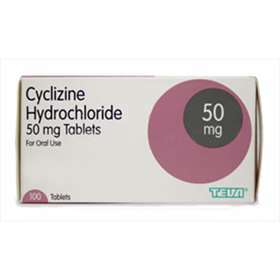 Each tablet contains 50mg Cyclizine Hydrochloride. Contains Lactose.